Heat 3-4 turns of olive oil in a large nonstick skillet over low to medium-low heat. Add onions and sprinkle with 1/2 tablespoon salt. Cook onions for 30-45 minutes, stirring occasionally. They should be barely simmering. If they’re sizzling or getting brown too quickly, your heat is too high. When onions are caramelized, remove from pan with slotted spoon and set aside. In a medium saucepan, heat 3 tablespoons of olive oil and pat of butter over medium high heat. Add garlic and cook for 1 minute. Add rice and stir until rice is thoroughly coated with oil. Turn heat to high and add water and 1/2 teaspoon salt. Stir to combine. When water is boiling/bubbling, cover rice and turn down heat to low and simmer, covered, for 10 minutes. Remove lid and squeeze in 1 1/2 tablespoons lime juice (approx. 1/2 of a lime) into rice and stir. Put lid back on and simmer for another 10 minutes or until all liquid is absorbed. Remove from heat and transfer rice to a large bowl or serving dish to cool for about 5 minutes. 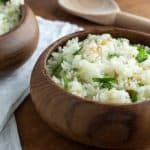 Add chopped cilantro, caramelized onions, and grated cheese to rice. Squeeze the remaining 1 1/2 tablespoons of lime juice (or other 1/2 of lime) over rice and stir.